This is a new thread to discuss the matches of our rivals Borussia Dortmund and any injuries/suspensions they may have. 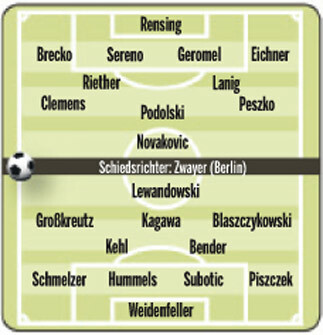 This is Bild's predicted formation for today's match away to 1. FC Koeln. Former FC Bayern players Rensing and Podolski are expected to start. Any idea when Goetze is coming back? FCBayernMunchen wrote: Any idea when Goetze is coming back? His projected comeback date is in the match against FC Bayern. MUTU wrote: His projected comeback date is in the match against FC Bayern. Köln-Dortmund game delayed for 10 minutes. Traffic. Come on Poldi and Rensing! Do something useful for Bayern! Why don't teams bother with defending against Dortmund yet park the bus against us? Köln is playing a ridiculously high line in their final third, but against us, they brought back the three-man central defense. I've looked at our remaining games as opposed to Dortmunds, and our games are, on paper, somewhat easier. If we win against them on their on home turf we have a great chance of leapfrogging them in the table. Weidenfeller fail - came out of the goal into no mans land and allowed a header to go over him. Come on Köln, you can do it. I have a really good feeling about this game. I hope Dortmund hit the post 5 times and Koeln scores from a deflection, own goal from Dortmund and a shot hits the post then the back of Weidenfeller and goes in.